Don’t let the sneezing season get you down! 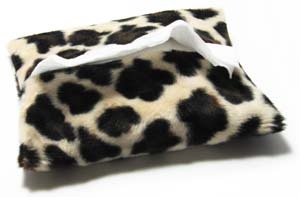 With our stylish tissue holder, you can snort, hack and expectorate wherever you are with a touch of glamour. The tissue case has a finished size of 3.5 x 5.5″; it holds most purchased travel-sized packs or tissues you’ve folded in thirds yourself. Its retro style secret is Velboa, a ravel-resistant low pile furry fabric which comes in solid colors as well as animal prints. Bolts of fabric usually come in standard widths such as 45″ and 60″. Thus, 1/4″ yard of Velboa will be a piece which is 9″ wide and 45″ or 60″ long. That will provide enough Velboa to make several tissue holders, scrunchies or other small projects. 1) For each tissue holder, cut a 8 x 6″ rectangle of fabric. 2) Lay the fabric right side (furry side) down on an ironing board. Turn over half of inch of fabric at each short end so the rectangle measures 7 x 6″. Press. Note: if you are using a fabric other than Velboa and it’s something that will ravel, use your favorite edge finish on these ends. Shown at left – the fabric with the edges being turned over. 3) Sew close to raw edge of fabric. Shown at left – the fabric after the edges have been turned over and sewn down. The grey area is the right/furry side of the fabric. The white is the wrong side of the fabric. 4) Flip the rectangle over, so that the furry side is up. Fold the short ends toward the middle so they meet roughly at the center. Pin. Shown at left – after folding the short ends toward the middle. 5) Stitch remaining sides in a 1/4″ seam. Turn tissue holder inside out. If necessary, you can trim the seam allowances of the corners a bit to make it turn better. Fill it with tissue and you’re done! Shown at left – after sewing the sides in a 1/4″ seam.